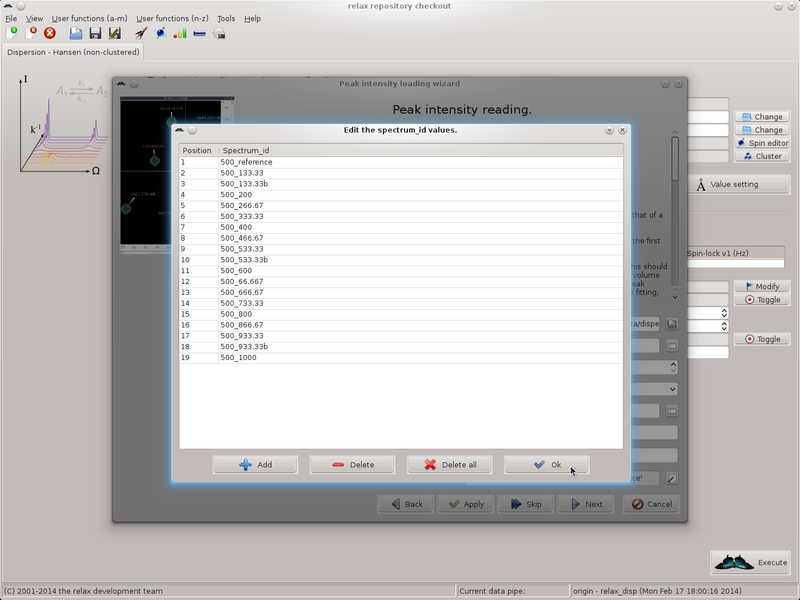 The standard way for handling experimental NMR data for starting a relaxation dispersion analysis in the relax GUI is to load the peak intensity values (either height or volume) from a peak list. For a list of all the currently supported peak list formats, see the spectrum.read_intensities user function documentation in section 17.2.216 on page . Note that relax also accepts pre-fitted or pre-calculated R2eff or R1ρ values via the relax_disp.r2eff_read and relax_disp.r2eff_read_spin user functions (see section 17.2.175 on page and section 17.2.176 on page respectively), however this is not the standard way of using the GUI. As this is not tested, if you decide to work with pre-calculated relaxation rates please report any bugs encountered as described in section 3.4 on page . To access the user functions, click on “User functions→relax_disp→r2eff_read” or “User functions→relax_disp→r2eff_read_spin”. For all of these files, the experiment type is SQ CPMG and the relaxation delay time is 30 ms. All files are located in the test_suite/shared_data/dispersion/Hansen base directory. 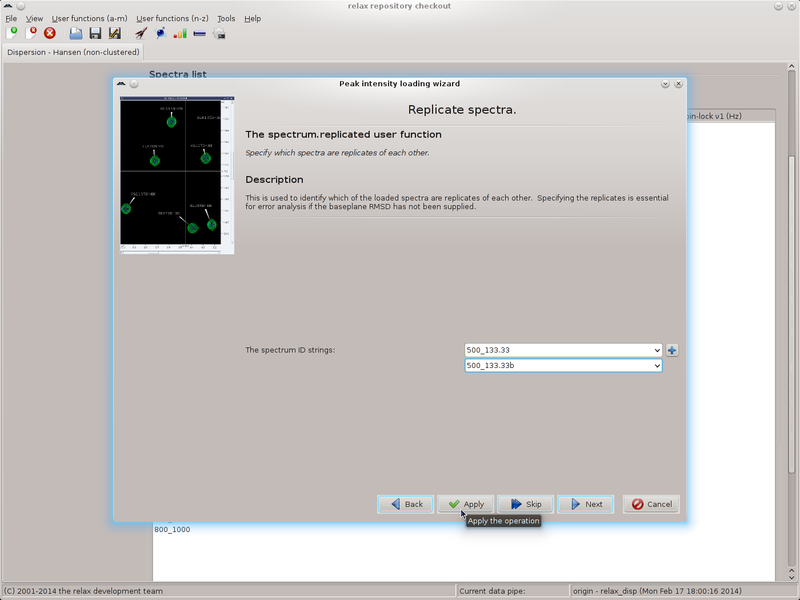 Click on “OK” to return to the spectrum.read_intensities user function wizard page. To see if the data has been correctly entered, click on the buttons to the right of the GUI elements. You should see the files and spectrum IDs correctly listed in the multiple file selection window and the sequence input window respectively. RelaxWarning: The precise spectrometer frequency should be supplied, a value such as 500000000 or 5e8 for a 500 MHz machine is not acceptable. Please see the 'sfrq' parameter in the Varian procpar file or the 'SFO1' parameter in the Bruker acqus file. In this screenshot it can be seen that some of the metadata is missing. 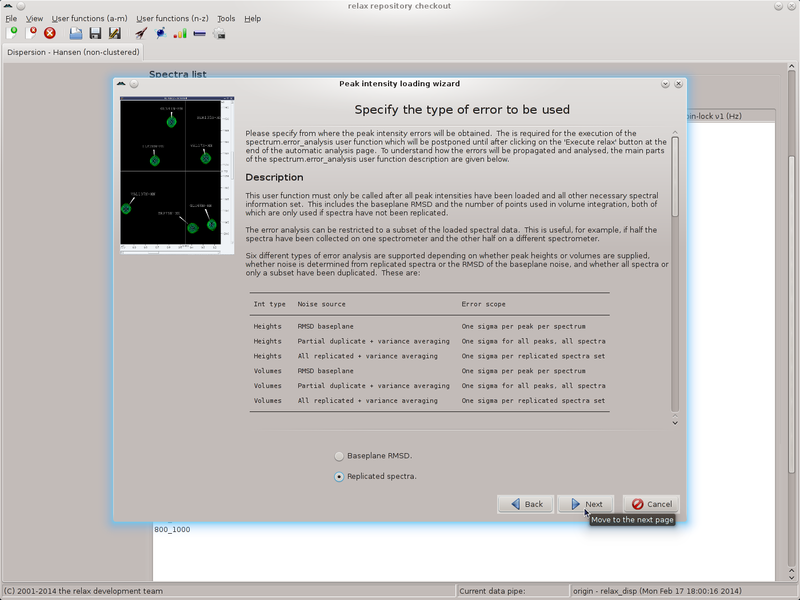 This often happens due to the large amounts of metadata specified in the peak intensity loading wizard and human error. The missing metadata can now easily be filled in by right clicking on the corresponding row. For example here the “500_733.33” spectrum ID does not have the experiment type set. 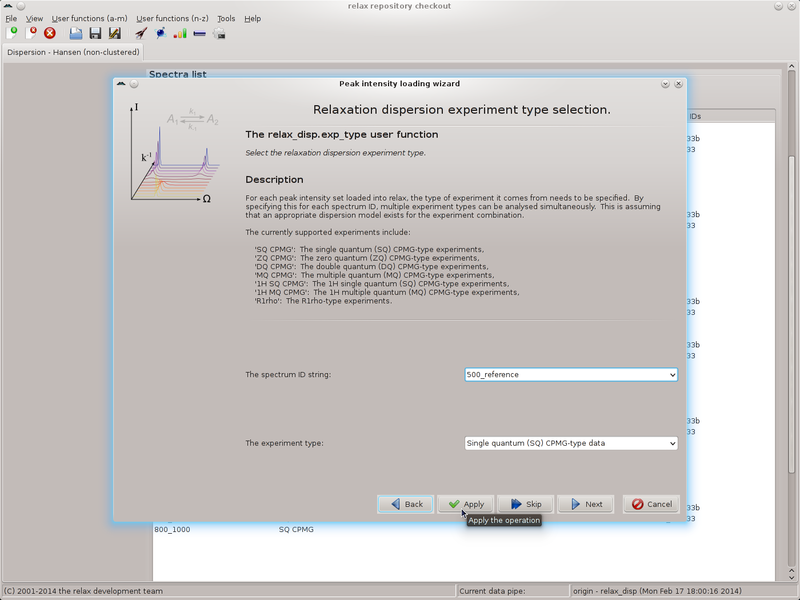 Simply right click and select the “Set the experiment type” menu entry from the popup menu. 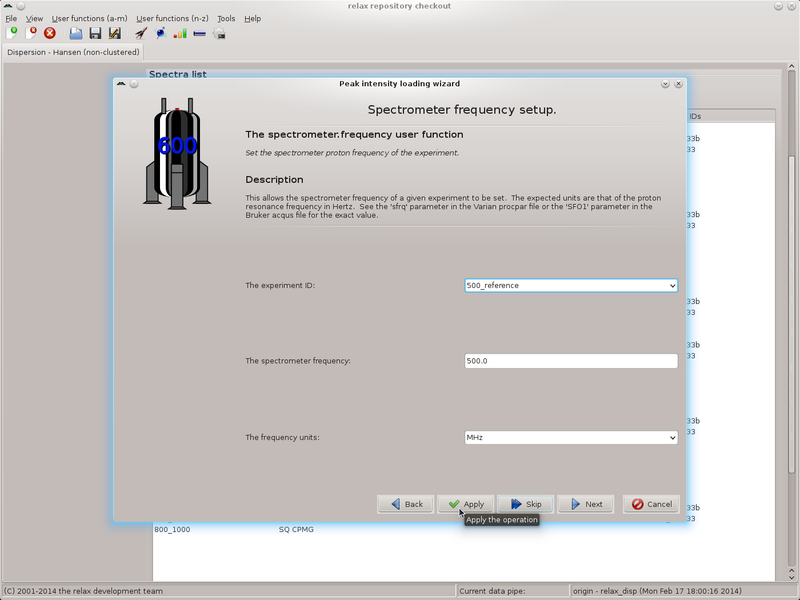 For the missing spectrometer frequency for the “500_866.67” spectrum ID, the “Set the spectrometer frequency” menu entry can be used. For the missing νCPMG value for the “800_133.33” spectrum ID, the “Set the CPMG pulse frequency νCPMG” menu entry can be used. All of the metadata should be double and triple checked and fixed where required using the popup menu. Any errors in this metadata would be catastrophic for the subsequent dispersion analysis.